I wanted to share this photo I took because it depicts a nice example of providing passive value. Coming up with the idea and adding this wall art required a one-time investment of time and energy. But once it’s shared, it can continue to provide value in the form of laughter and amusing conversations for visitors year after year. Could this be monetized? Indirectly, sure. It could potentially cause more guys to talk about it… or to encourage their friends to use this restroom because of the silly surprise inside. Outside this restroom are several restaurants, and it’s just down the hall from a big casino, which offers plenty of opportunities to spend money. If you’re curious to know, this restroom is located inside the Las Vegas Hotel (formerly known as the Las Vegas Hilton), next to their conference center. 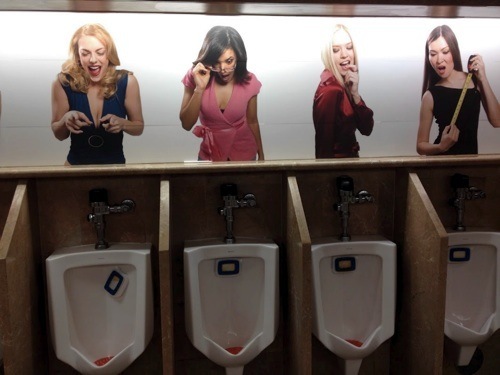 This would be one of the main restrooms used by convention-goers. A common mistake people make in trying to creating passive income streams is that they focus on monetizing before they have anything to monetize. This is like fishing in a dry riverbed. It’s wasted energy. And people do this ALL THE TIME! I dare say that most of the passive income failure stories I hear involve people trying to monetize a non-existent value stream. They try to go straight for the money, and their results are predictably weak. They’re doing the business equivalent of begging, and so they generally earn no more than beggars do. You can’t produce a stream of passive income until you’ve have a stream of passive value, just as you can’t catch fish until you’ve found some water where fish are swimming. Focus on creating the value stream first. Then when you know you have a healthy stream going, you can work on monetizing it. Stupid as this sounds, this is pretty much what people do when they get all gung ho about passive income with nary a concern for passive value. Once you’ve integrated the mindset of creating passive value, and it feels like second nature to you, then you can think about monetizing earlier because you’ll know where to look for monetization opportunities. But until that becomes a habit, I encourage you to think deliberately about creating passive value streams first, before you give any thought to monetizing them. Get good at finding water first. Then work on your fishing skills. My challenge to you now is to do something simple that can provide some passive value for others. Remember that even a photograph can do that. Where can you share this little piece of value such that a year from now, people might still be receiving the value you provided? Don’t worry about monetizing it. Just put something out there for free. Make it so. How do you know if you’re really providing value? Feedback. Your attempt is only a guess. Other people are the ultimate judges of whether or not you provided value to them. When I saw the men’s restroom mentioned above, I laughed and smiled. I snapped a photo. I shared it. For me this provided some value. If it does that for a lot of other people too, then whoever created this did a good job of creating a passive value stream. If you do something that you believe will make people laugh, and no one laughs, then you didn’t provide value. You didn’t create the stream. That’s okay. It happens. In your attempts to provide value, you’ll often miss. There is a skill element to value creation. It takes time to discern what people receive and appreciate as value, and it takes time to adjust your aim. I’m sure I’ve written many articles that few people cared about. But this helped me get better at understanding what people desire and how that matches up with what I can provide. The more you condition this habit of looking for ways to create and provide passive value to others, the easier it will be for you to enjoy streams of passive income.